This show needs to sparkle and shine! You need a bit of glam and glitz to give your production a real 'WOW' factor. In fact, you need loads of costumes (and some need to be splurgable!) We can help you with this. 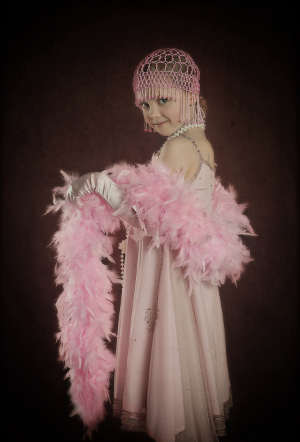 We've collected many wonderful costumes for you to use in your show - ranging from the shiny fringed dresses, the longer glam dresses with boas or capes and many 1920s style flapper dresses. There are suits for boys and girls and you can cover them with splurge (just follow the cleaning instructions if you do). Some trilbies and headbands are also included in the hire. You can hire more of everything from us if you need to. NOTE: For 2019 we are re-vamping our hires, adding things and offering a more versatile costume hire. Details will appear as we compile them - contact us for up to date information! Photos on this page courtesy of fo2oimaging.com. "I just wanted to say a big thank you to OffBeat Theatre for providing top class costumes and props. The guns were a huge source of excitement and fun and at the end of the show almost every child in the audience wanted to fire one! The quality of the costumes was excellent. We had a very good variety of sizes and looks, ample for everyone in our large cast. Thanks once again for adding to our amazing experience." We can send our costumes to the UK (obviously) and usually anywhere in EUROPE. We do not send costumes beyond Europe though - ever. Beyond Europe and it becomes very costly and time-consuming (plus the whole 'exporting' hoop to jump through). Sorry. Details of the NEW options for 2019 will appear shortly. Meanwhile you can CONTACT BUGSY HIRE to talk through your requirements. PUTTING ON ANOTHER SHOW SET IN THE 1920s? We can probably help - we have loads of spare costumes. Just get in touch and we'll see if we can put a hire together for you. 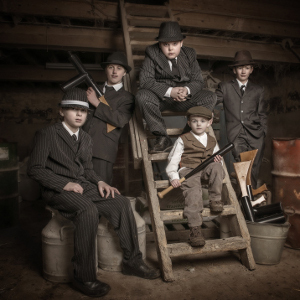 Check out our collection of photos and drawings to help you design your own Bugsy Malone stage set, get the props right and find the right style of costumes. Many of the photos are from our own production and some of the costumes are actually still going! Please have a browse and feel free to pin anything you like onto your own pin board - it's a great way to get your design ideas organised. page for pics of our current hire costumes. Just let us know what you need - we love helping out!